AuthenticWatches.com is a family-owned business dedicated to offering Swiss made luxury watches at competitive prices. In 2001, the company made the bold decision to move completely online, expanding both its customer base and luxury brand offerings. AuthenticWatches.com experiences 90% decrease in fraud through Amazon Pay versus other checkout options. Trust and authenticity are essential to the success of AuthenticWatches.com. Yet as the company grew, it became a larger target for fraudulent purchases. The company originally chose Amazon Pay to simplify the checkout process for the millions of customer who already have an Amazon account. By adding Amazon Pay to its site, AuthenticWatches.com now benefits from Amazon’s proven fraud-detection capabilities and streamlined checkout process -- keeping costs down and passing the savings on to their customers. The results include more revenue per shopper, better fraud protection, and increased customer trust. Since offering Amazon Pay on its website, AuthenticWatches.com has increased its average order value by 33%. One reason for this growth is the company’s ability to route large online payments through Amazon Pay, leveraging Amazon’s proven fraud-detection capabilities. Since implementing Amazon Pay, AuthenticWatches.com has experienced a 90% decline in fraudulent payment transactions versus some of its other payment methods. “Amazon Pay eliminates the need to authenticate orders. Fraud prevention is no longer our responsibility. It is up to us to deliver the ordered watch to the address provided to us.” Kacherian says. And this decline has come without having to invest in hiring. Amazon Pay also allows AuthenticWatches.com to offer its customers a faster and more streamlined customer checkout experience. Customers who use this payment method can complete their purchases with just two clicks after login — compared to the five clicks required with some other payment options. “Although we have a 1 page checkout, it still takes customers some time to type in their name, address and payment information. By offering Amazon Pay the customer just needs to log into their Amazon account and choose an address and a payment method.” Kacherian says. 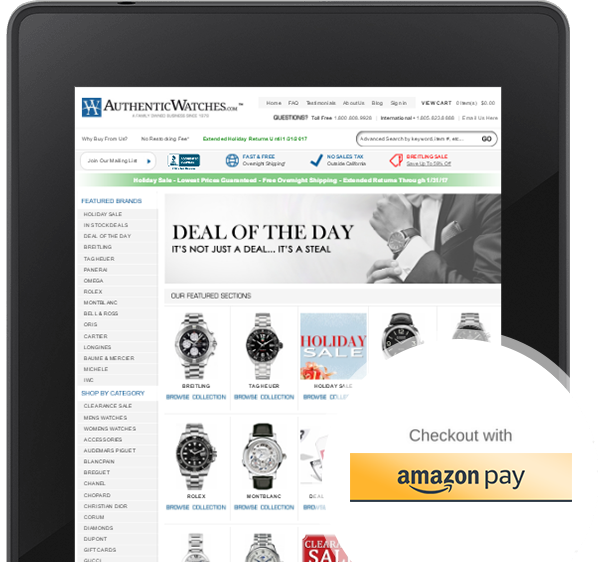 Unlike other checkout methods, Amazon Pay reduces confusion by allowing shoppers to remain on the AuthenticWatches.com site. “A lot of people aren’t savvy online, and there’s a chance you’ll lose them if they have to go elsewhere and then come back,” says Kacherian. Perhaps most importantly, Amazon Pay has helped AuthenticWatches.com improve its credibility with shoppers. “Every day, we get questions like ‘How can I trust you?’ and ‘How can I trust the watches you sell?’” Kacherian says. “Working with a company like Amazon really helps us build trust with our customers."